The Beats Solo 3 Wireless feel like they’re having something of an identity crisis. On the one hand, they’re among just a few pairs of headphones to sport Apple’s new W1 chip (joining two other Beats models and Apple’s own Airpods), meaning they work particularly well with the latest iPhones. On the other, they ship with just a 3.5mm audio cable – no Lightning cable in sight. It’s an odd decision. Of course, making the Beats Solo 3 Wireless attractive to everyone is of prime importance to Apple and Beats, and the W1 chip can benefit other handsets too. But the lack of an option for a direct physical connection with the phone these cans work best with is puzzling to say the least. Apple believes that the future is wireless, and these headphones show the potential to make it happen. The new W1 chip offers huge improvements to the cable-free experience (more on that later), and that alone could well make these Solo 3s worth a look. Not much has changed in the looks department since the Beats Solo 2 Wireless. Unashamedly plastic, they’re available in the same five colours as the iPhone 7 – both shiny and matte black, silver, gold and our rose gold review sample – as well as white and purple. The arms fold down to make them more portable in their included carry case and their plastic construction helps keep them lightweight. 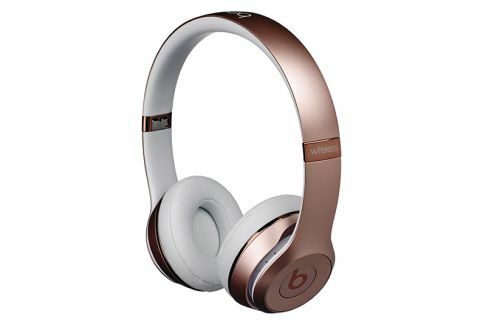 They have an on-ear fit, with a faux leather material on the earpads and headband cushion. The white colour on all but the black design has a tendency to get a little grubby, and they’re still a little tight fitting for our liking. They may well loosen up over time, but during testing, we found we needed to give our ears regular breaks during longer listening sessions. Controls are once again placed on the left hand earcup – press down the Beats logo to control playback or activate Siri, with volume controls to the top and bottom. They work well enough, but make quite a clunking sound in your ear when using them. Of course the headline feature of these cans is the W1 chip, and it offers a number of benefits, especially to iPhone users, but some that Android phones can take advantage of too. For iOS users, there’s a seamless link with your iPhone. Turn the headphones on and your iPhone will ask if you want to connect. Android users will have to spend a little longer following the regular Bluetooth pairing procedure, but they will at least get to share two of the bigger improvements the W1 chip has to offer. The biggest of those is battery life. At 40 hours, the Solo 3 Wireless’s battery life is nothing short of outstanding, and quite simply unheard of in current wireless headphones. Thanks to better battery management by the W1 chip, it’s a huge jump from the 12 hours on Beats’ previous model. It should see you cable-free for up to a full week before needing a recharge. It’s hugely convenient and a big step forward, plus there’s Fast Fuel charging tech on board to get you three hours of playback from five minutes of charge too. There’s also newfound range on offer here, thanks to the inclusion of Class 1 Bluetooth (instead of Class 2 found in the Beats Solo 2 Wireless, and many other wireless cans). On paper, this ups the range you can move from your source from 10m to 100m, though this will of course depend on your environment. Certainly, these Solo 3s are able to get much further away from our phone – and through several doors – before the music begins to break up, compared to many rivals, which tend to be around the standard 10m, with a clear line of sight. Despite these game-changing improvements to the wireless experience, the Solo 3s remain the same proposition as the Solo 2 Wireless. And that’s a shame. It’s not that the sound is bad – these are much better than the Beats headphones of years ago – but for all they give us in full-bodied sound and enthusiasm, they miss out in subtlety and refinement. Play Can’t Go Wrong by Wiley and the Beats are in their element. The aggressive bassline that forms a large focus of the instrumental is rich and weighty, with the sharp, snappy vocal delivered with attack and authority. There’s no doubt that the low end is bolder and more forward than the rest of the frequency range, but it’s not as unwieldy as some Beats naysayers would have you believe. We’d just like it slightly tighter and more insightful for a more refined sound – you get power here, but not much nuance. Indeed that’s often the case across the board. These play to their strengths by going big on excitement, throwing themselves enthusiastically behind any piece of music, and doing a good job rhythmically. Pop, hip hop and dance tracks sound pretty good, but listen closer and you’ll notice they aren’t capable of digging much below the surface. Play something a little more stripped back, like Alicia Keys’ Holy War, and though vocals sound clear and direct, they’re not hugely expressive or detailed. The accompanying guitar instrumental sounds a little flat too, lacking the dynamic talent to pick out the peaks and troughs in a guitar strum with conviction, and failing to signpost tempo changes between verses and chorus properly. The overall performance isn’t as explicit or engaging as we’d like. For long listens, it’s not just the fit we find tiresome, but the sound too. It’s also worth mentioning that these headphones go pretty loud, but aren’t the most isolating. Push the volume much past half way and you’re going to start annoying anyone sitting close by. The Beats Solo 3 Wireless headphone are a tale of two halves. On the one hand, they’re pushing the boundaries of wireless headphones technology further than we’ve seen before. On the other, their sound is crucially lacking in the detail and subtlety we expect from headphones at this price. They’re further troubled by talented competition. However, if the extra battery life, range and close compatibility with the iPhone interests you, the Solo 3 Wireless are well worth a look – particularly if you’re just looking for good-time headphones to pass the time on the way to work or school.